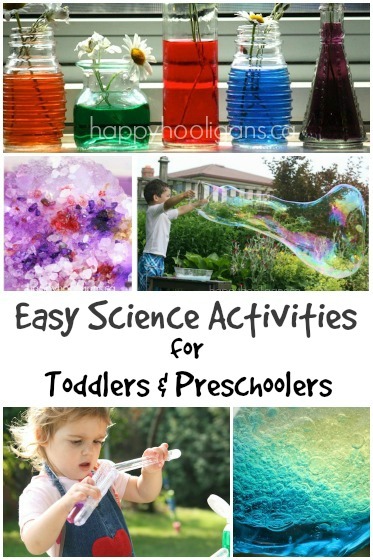 Looking for a quick and easy homemade gift for your toddler or preschooler to make? 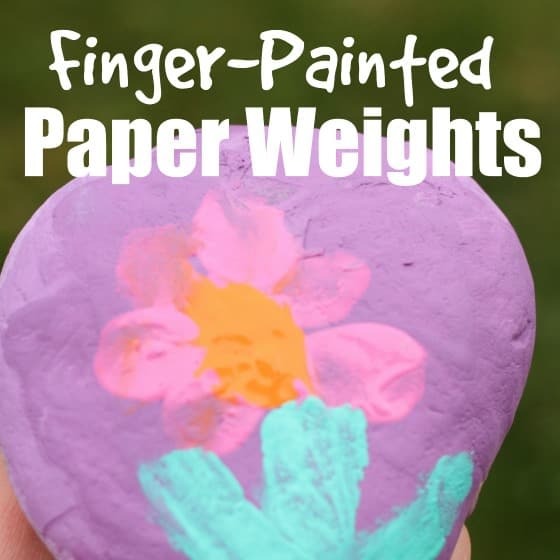 These finger-painted paper weights are perfect, and they won’t cost you a thing! 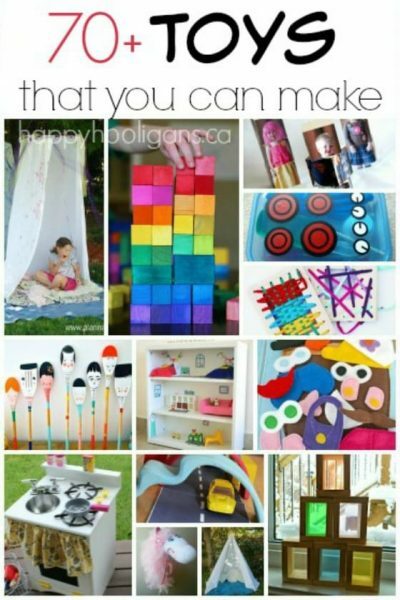 The hooligans love making homemade gifts for their parents. 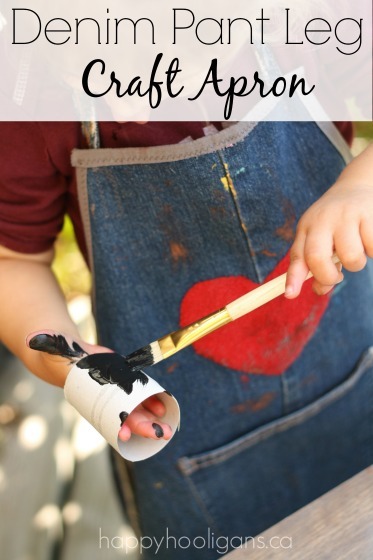 This little craft is perfect for Mother’s Day or Father’s Day. 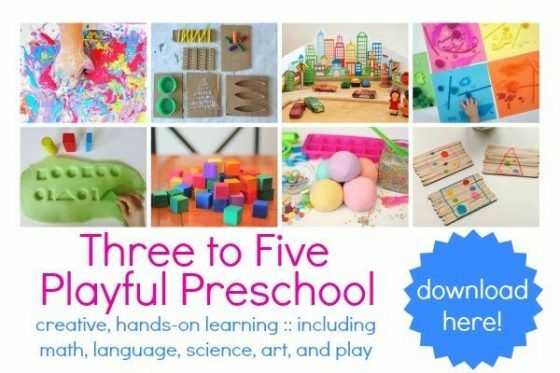 It would also be a lovely gift for your child to make for a teacher or a grandparent. Everyone can use a paper-weight, right? If you’ve been following us for a while, you know how much I love crafting with rocks and stones. 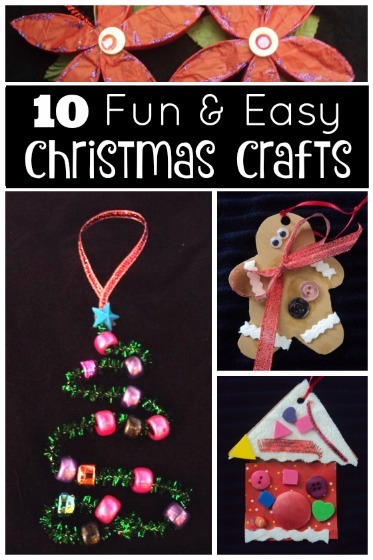 First of all, they’re free (always a bonus), and they’re really fun to decorate. One of the best things is that a trip to the beach is always in order when we’re making a rock craft. 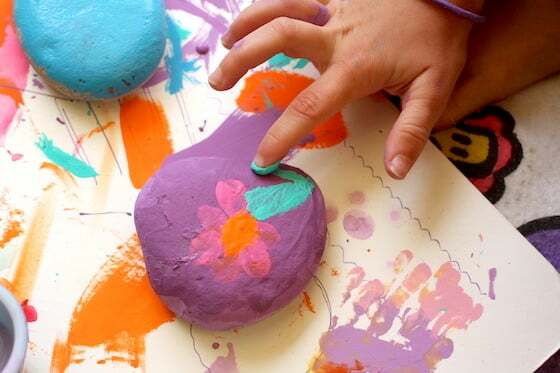 Our beach is covered with these smooth stones that are just perfect for painting on and crafting with. Check out the links at the bottom of this post to see more of my favourite ways to play and craft with beach stones. On this day, Miss Mess was hoping to make something for her mom for Mother’s Day. We had been to the beach just a couple of weeks before, and had a nice big bucket of rocks just itching to be turned into something. 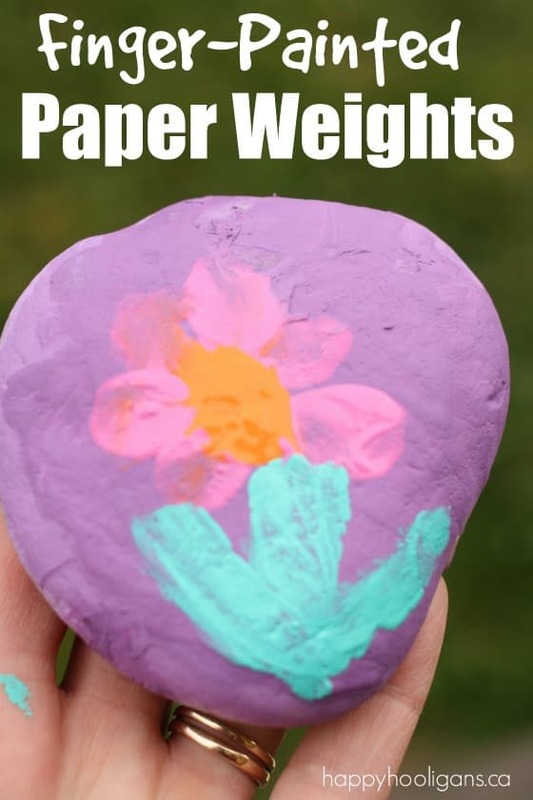 Paper weights are our go-to craft when we have rocks. We’ve made these painted paper weights before, and more recently we made these gorgeous crystallized rocks which can be used as paperweights. Miss Mess thought she’d like to finger-paint some paper weights this time. I thought that sounded like a great idea. She chose her rocks and her paint colours and she got to work. It was a beautiful day, and we were crafting outside, so I put a plastic table cloth down on the deck to protect it from the paint. Miss Mess started by base-coating her rocks with the acrylic paints. Acrylic paint dries quickly, especially in the sun/heat, so it didn’t take long at all for the rocks to dry. Depending on the colour and thickness of your paint, you may need to give your rocks a couple of coats of paint. Just let the paint dry in between coats. 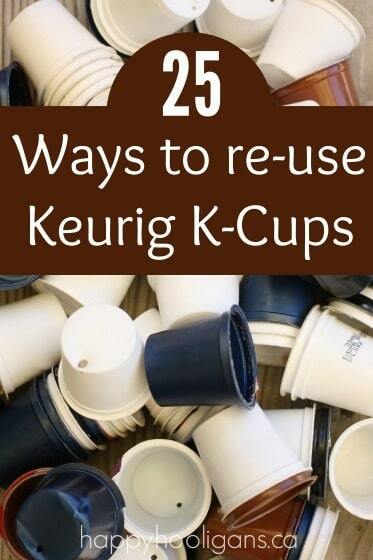 Set it in the sun, or give it a blast with the hair dryer. That always speeds up the drying process. 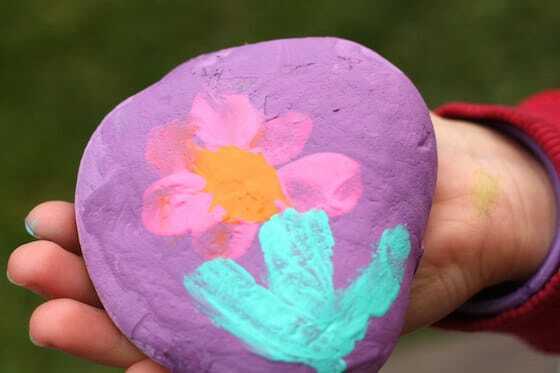 Then she decided she decided on a picture to paint on her rock – a flower. We had just finished making these gorgeous flower drop ornaments, so flowers were very much on her mind. She started by painting the petals of the flower. 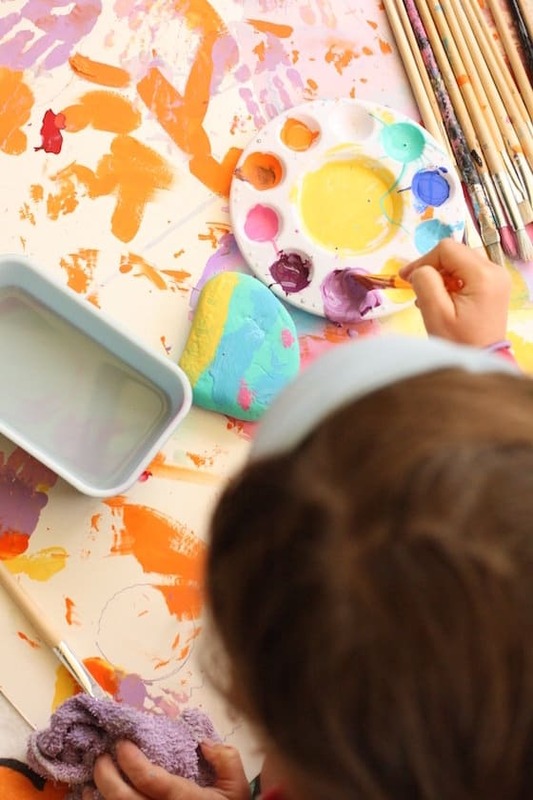 She pressed a finger into the paint tray, and dotted the paint around the top of the rock. She added a “center” to her flower, and then she added leaves and a stem by trailing a painty finger over the smooth surface of the rock. Voila! A pretty finger-painted flower atop a homemade paper-weight for mom! When your paper weight is completely dry, give it a coat or two of craft sealer. I didn’t get a picture of ours before we varnished, but a coat of varnish will add a lovely sheen to your rock (see what I mean here) , and it will protect the paint from ever being scratched.